Agricultural soils and our food supply are greatly deficient in trace minerals. It is vitally important to supplement our food intake with a mineral supplement to provide all the minerals we need. Charged minerals do not need to be broken down further for absorption. They are quickly taken up by the cells that line the intestinal tract and readily employed in the body. These "ionic" minerals also play an important role in supporting a healthy pH balance. Certain minerals are known as electrolytes, particularly potassium, magnesium, chloride and sodium. Electrolytes are needed to maintain proper fluid balance and to optimize your energy levels so you can function at your best. Electrolytes conduct electrical impulses in the body and also help maintain your body’s acid base balance for more energy and vitality. A deficiency of any one of these electrolytes—or even an imbalance—can cause a wide range of problems, including sluggishness, fatigue, decreased energy and cramping. 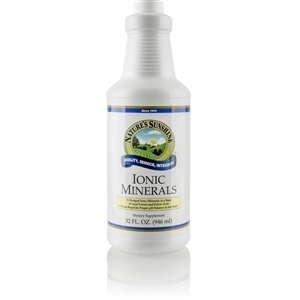 Ionic Minerals contains 70 charged (ionic) minerals, including electrolytes and trace minerals. This formula also has fulvic acid and açai berry extract to complement the minerals. Fulvic acid scavenges free radicals, supplies electrolytes, enhances nutrient transport, catalyzes enzyme reactions, increases assimilation and helps rebuild the immune system. Açai berry extract provides valuable antioxidants, amino acids, anthocyanins and essential fatty acids, plus a phenomenal flavor. • Supplies highly bioavailable ionic minerals, including electrolytes, to support bio-electric mineral-powered reactions throughout the body. • Helps regulate pH balance in the body. 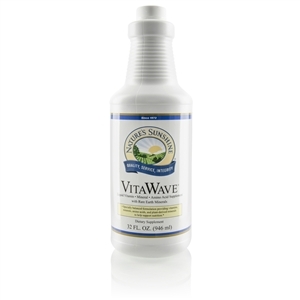 • Provides a full spectrum of 70 ionic trace minerals. • Supports the circulatory system with the antioxidant benefits of açai berry. Take 1 Tablespoon twice daily with a meal. *Daily Value not established or provides <2% of RDI Other Ingredients: Purified water, fulvic acid, vegetable glycerin, açai berry concentrate (Euterpe oleracea), red grapeskin extract (Vitis vinifera), tartaric acid, xanthan gum, sodium benzoate (preservative), citric acid, and acai berry(natural flavor). Warning: Accidental overdose of iron - containing products is a leading cause of fatal poisoning in children under 6. Keep this product out of the reach of children. In case of accidental overdose, call a doctor or poison control center immediately. NOTE: Anyone consuming distilled or reverse osmosis water should add 20 or 30 drops of Ionic Minerals per gallon. Vitamin deficiency is a major contributor to illness and disease. The usual all synthetic vitamins added to food products and sold as supplements in drug stores and supermarkets are NOT compatible with the body's energy. Only a portion of a synthesized nutrient may be able to be used by a cell. In fact, too much of certain synthetics, such as synthetic vitamin E, actually toxifies and disturbs the body. Further, most vitamin products are offered as tablets. Most of these are very poorly broken down. Septic tank cleaning companies report that astounding numbers of undigested vitamin pills appear in the human waste they collect. These "potty pellets" are evidence of many wasted dollars. CLICK HERE to check out our other excellent nutritional products.